On the way home, we found exactly two places to stop to get a taste of Native American history and culture. 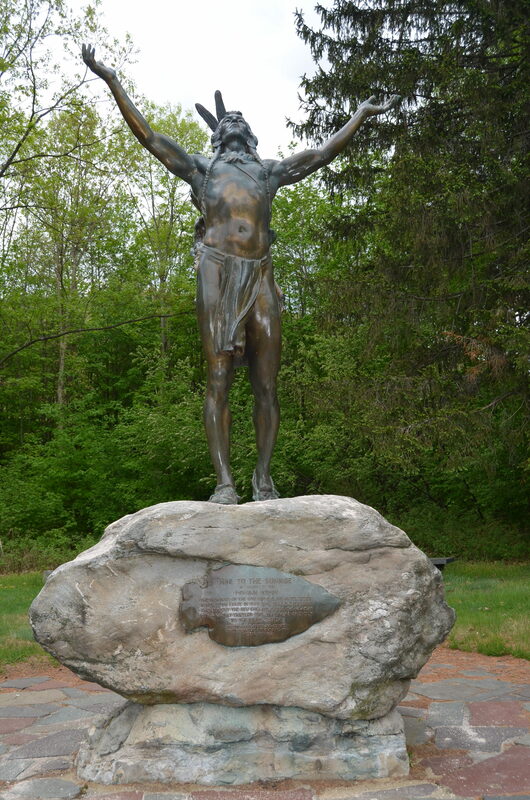 Somewhere around Charlemont, Hail to the Sunrise is a sculpture remembering the Mohawks and other natives who traveled this route. It’s a tasteful and rather moving sculpture, but that’s all there is. That was a quick stop. 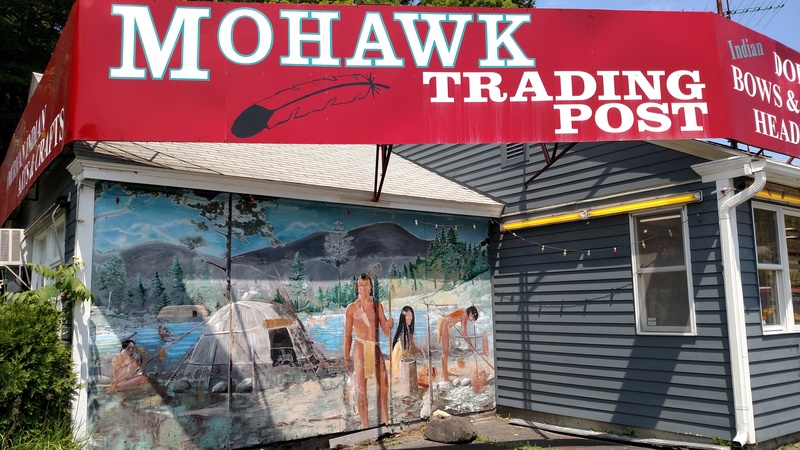 And further east in Shelburne, the Mohawk Trading Post is a Native American-owned souvenir shop. There’s also the Big Indian Shop up the street (technically, Native Views, but better known as the Big Indian Shop because of, ahem, the Big Indian out front). But we stopped at the marginally more tasteful Mohawk Trading Post. I liked the thematic mural on the facade, which seemed culturally and historically accurate (though I’m not an expert). But there was also a teepee on display, and I’m pretty sure that none of the New England natives ever spent the night in a teepee. Anyway, Daddio had promised that the twins could pick out a souvenir. Twin S came away with a pretty cool drawing book of 261 North American Indian Designs by Madeleine Orban-Szontagh. And Twin V came away with a brightly colored, feathered war bonnet — the likes of which were ne’er seen in New England, or possibly anywhere. What is a mother who is trying to raise culturally sensitive children to do? I ask in all earnestness. Part of me feels I should have prohibited the purchase of the headdress. But another part of me wants to allow my children to explore history and culture in a way that is not overly restrictive and nitpicky. The more I talk and explain and reprimand… the more my children tune out and lose their enthusiasm. If they have an interest in Native American culture, I want to encourage them to pursue it–not beat it out of them. A more adept educator probably could have made this a truly teachable moment, at once enlightening and inspiring the children and destroying the ethnic stereotypes. But I was flummoxed. I explained that most Native Americans did not wear these headdresses or live in teepees — in fact, none of the New England tribes did. We took a photo–possibly offensive, to some–and moved on. Sigh. Did I mention that this place is Native American-owned?